Posted on November 6, 2012 by Philip O'Hanlon. Philadelphia was a blast; it was great hanging out with Dave Serota again; he & his wife Kelly put on a terrific music seminar for the Philadelphia Audio Group with three rooms running simultaneously. 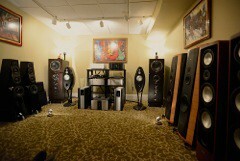 Andrew Jones from TAD presented his compact monitors while John Franks showed off his new DSD compatible DAC.. Enjoyed a marvelous dinner afterwards with Andrew Jones (TAD) and John Franks (Chord Electronics), the latter I had not seen in almost a decade & we renewed our friendship, quite easily. In this short presentation with the Vivid B1 driven by Luxman D-08 / C-600f / M-600A and a Brinkmann Bardo / Tri-Planar U2 / Brinkmann Pi we managed to cover most genres of music from Blues to Jazz, Classical & Pop. Beyonce’s soundstage managed to wrap itself around & behind the listeners head and Michael Jackson’s Billie Jean was exceptionally punchy; it’s amazing what two pairs of 6 1/2″ woofers can do. My personal favorites were what was played after the demos, notably Hans Theesink & Terry Evans Visions on LP; it was wonderful hearing two such distinct voices, especially when they sang together on “Vicksburg Is My Home” and in their guitar work – one playing acoustic guitar to the others electric guitar. Magical. The other album of note was Hampton Hawes’ All Night Session Vol. 3 – I had not heard his version of Do Nothin ‘ Till you Hear From Me – wow, what a fabulous jazz pianist! Originally recorded in 1956 with Jim Hall on guitar, Red Mitchell on bass and Bruz Freemean on drums – I can assure you that I will have all three albums in near mint condition within a week or two. This entry was posted in Show Reports. Bookmark the permalink.